As the lead sponsor of The National Nurse Act, H.R. 1651, Congresswoman Eddie Bernice Johnson (TX-30) embodies the role of nurses in public health, advocacy and leadership. As the first nurse elected to the United States Congress, Congresswoman Johnson has been a foundational supporter of a National Nurse for Public Health. Recently, Congresswoman Johnson offered the following words in support of a national nurse, “Nurses play a critical role in the prevention and management of our nation’s deadliest conditions like diabetes, cancer, heart disease, and opioid addiction. They are also the first to comfort those who are in distress. The National Nurse Act provides an opportunity to bring forth the significant and trusted voice of the nurse to the ongoing conversation about health and health care in America. Thanks to the leadership of dedicated elected officials like Congresswoman Johnson, The National Nurse Act is moving steadily closer to reality. Together with the American Nurses Association (ANA), the National Nursing Network Organization honors and celebrates the work of nurses during National Nurses Week from May 6–12, 2018. 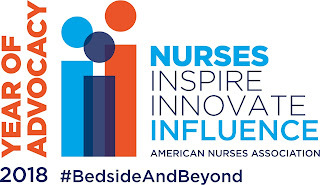 This year, the ANA recognizes the vital role of nurses in elevating the health of individuals and communities through the theme “Nurses: Inspire, Innovate, Influence.” Additionally, ANA declared 2018 to be the “Year of Advocacy”. A National Nurse for Public Health would embody the leadership role of nurses in innovating and advancing the health and well-being of patients, families, communities, and our entire nation. Each year, National Nurses Week honors the foundational work of Florence Nightingale around her birthday. This year, we reflect on how nurses protect and improve public health. To mark the occasion, the ANA provides the National Nurses Week 2018 Toolkit. During this Nurses Week, let’s recognize nurses as America’s most trusted professionals as we advocate and influence change. What better way to honor the work of nurses than through recognition of a National Nurse for Public Health.